December | 2013 | Mike Lamberti, From Margate To Cleveland, And Back ! He’s as imposing as they come, a hard-nosed, somewhat gruff-voiced man who can easily make you run the other way if you tick him off. But underneath that exterior lies as compassionate a man as they come, a family guy through-and-through, a man who met his mortality at a relatively young age and not only prevailed, but devotes his daily endeavors to making sure others can appreciate the gift of life as much as he. 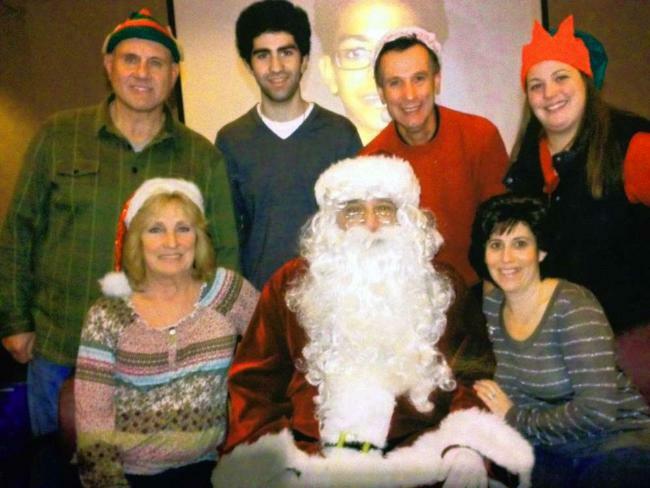 Welcome to Mike DiPiano’s world, and on Dec. 20, 2013, ‘Big D’ will be in familiar territory when he dons a big red suit, white beard and black boots at St. Barnabas Medical Center in Livingston to ensure some special youngsters will have a memorable Christmas holiday. Mike DiPiano (front row, center) and his elves will be making some beautiful children smile at St. Barnabas Medical Center Christmas party on Dec. 20. ‘Big D’ and his elves will be giving out presents and hugs to children whose lives have been changed by the gift of life, an organ transplantation. Many of you probably know DiPiano’s story. At age 44, his life was drawing to a premature conclusion with kidney failure. A devout Christian, he had received the last rites. But DiPiano’s life was given a new meaning when he received a new kidney and pancreas, from a donor known as Sean, a 21-year-old who was killed in an automobile accident. The transplant took place on Oct. 25, 1998 and now, as DiPiano enters his 63rd year of life, the big man has never hesitated in helping others learn of the value of organ transplant and the need for people to be a donor by simply signifying as much on their driver’s license. Mike has extended his message to countless amounts of people, as well as groups and wrestling tournaments. A legendary grappling coach at St. Benedict’s Prep in Newark, the husband and father of three retired (so to speak) in 2012, moving with wife, Karen, to Florida. But Nutley and Belleville are still home for the DiPianos, who are home for to spend the holidays with daughter Michelle and sons Michael and Frank. All three DiPiano siblings are successful high school coaches today, following in dad’s footsteps. At St. Barnabas, Mike will put smiles on the faces of children, many of whom are also recipients of an organ transplant at a very young age. Other children may be recovering from illnesses which could keep them in the hospital for the holidays. For Mike, it really doesn’t matter what the condition. If that child can draw a smile from seeing he and his friends on Dec. 20, it’s all that counts. In January, 2014, the fourth annual ‘Organ Donation is a Major Decision’ high school wrestling tournament will be held at Demarest High in New Jersey. It began three years ago and features eight teams in a team tournament setting and was the brainchild of Mike DiPiano. In the meantime, as the Christmas holidays near, Mike DiPiano will be back home, spreading his cheer and love for life to some great kids, as well as his extended family. It is indeed the true meaning of the holiday, and it will be wonderful to see Mike again on Dec. 20. He’s been out of high school now for nearly 14 years, but David Cordoba will tell you about every high school wrestling match he competed in while wearing a Kearny High School singlet. Cordoba, a 2000 KHS grad, had a decorated high school wrestling career, putting together a 138-4 record in four varsity seasons. He won the 1999 state championship while finishing second in the state in both 1998 and 2000. As a freshman in 1997, he lost just one match, in the state semifinals, and eventually wrestled back for third. Cordoba finished undefeated in his junior year (1998-1999), and won the state title by defeating Frankie Edgar of Toms River East, in the 130-pound final. David Cordoba celebrating a big win from his high school days. Yes, that Frankie Edgar, today a renown Ultimate Fighter. “A lot of people will say, ‘wow you beat Frankie Edgar? '” Cordoba said. “Would I want to get into a cage with him now? No. But the relationships you build in this sport last a lifetime. Frankie and I get along good. And being a state champion stays with you, forever. Cordoba will be on hand this Saturday, Dec. 14, at Princeton University for a big match between Princeton and Rutgers at Jadwin Gym. Before the first bout commences at 5 p.m., the Tigers will be honoring all the living NJSIAA champions. Princeton assistant coach Joe Dubuque, himself a two-time NJSIAA champion at Glen Ridge High School (2000 and 2001) before winning a pair of NCAA titles at the University of Indiana (2005 and 2006) has been proactive in putting together the event. Dubuque will also be hosting a wrestling clinic at Princeton on Saturday, which starts around 2 p.m. In the annals of New Jersey high school athletics, few sports invoke the passion that wrestling does and Princeton head wrestling coach Chris Ayres, who graduated from Newton High in Sussex County, NJ, can’t wait for Saturday’s festivities. The first New Jersey state champions in high school wrestling were crowned back in 1934, meaning a wrestler from that era could very well be a World War II vet and is in his late 80s. In 1934, there were nine champions, with five hailing from Ayres’ alma mater. The weight classes back then started at 95 pounds and extended through the heavyweight bracket. Cordoba hopes people think of him now as a coach. For Cordoba, seeing a lot of old friends at Princeton will be special. “We’d go at it on the mat pretty good, but in the end, we had a lot of respect for each other,” Cordoba said. “And we have each other’s backs today, too. It should be a great time, seeing those guys again. It’s a special fraternity. 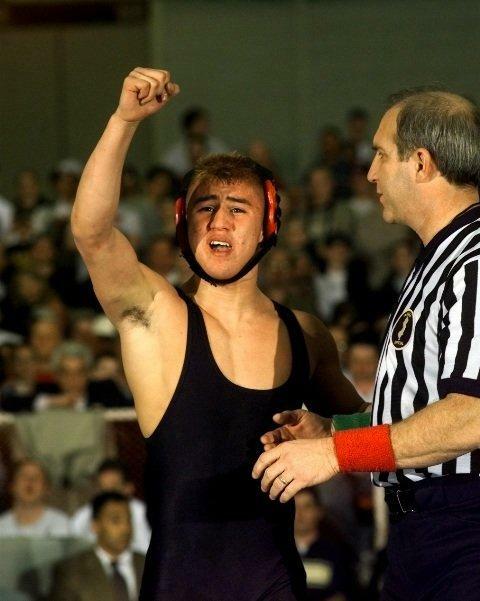 Steve Martell’s final high school wrestling match occurred on March 6, 2004, when, at Boardwalk Hall in Atlantic City, he concluded an undefeated season by winning the 152-pound NJSIAA championship, defeating Kody Hamrah of Bishop Ahr in the final. Martell became just the second state champ in Caldwell High School history, with Blake Maffei earning the Essex County school’s first championship 13 years earlier. For Martell, the 10th anniversary of his state championship presented a good time to recall that 2003-2004 season. And with a special afternoon planned at Princeton University on Dec. 14 for all the living NJSIAA champions, the memories came flooding back for Martell, today a police officer in nearby Little Falls, NJ. When reminded how difficult it is to win a state championship, Martell agreed. On Dec. 14, Princeton will face Rutgers in a NCAA match at legendary Jadwin Gym, but before the first bout commences at 5 p.m., the Tigers will be honoring the NJSIAA champions. Princeton assistant coach Joe Dubuque, himself a two-time NJSIAA champion at Glen Ridge High School (2000 and 2001) before winning a pair of NCAA titles at the University of Indiana (2005 and 2006) has been proactive in putting together the event. Dubuque will also be hosting a wrestling clinic at Princeton on Saturday, which starts around 2 p.m.
For Martell, the opportunity to see men who attained state gold provides a unique opportunity to mingle among a small fraternity. Ironically, as a freshman, Martell wrestled Dubuque, twice, in an Essex County and District 13 final at 119 pounds.